Advent of technology has simplified a lot of things in the present time. One of the advantages is digitization that enables easy transactions using the medium of the internet thereby opening doors to virtual connection. While we all are well aware of plastic money including debit cards and credit cards, virtual card India is the latest metamorphosis in the platform of online shopping. What Exactly is Virtual card? How does the working take place? Why is the verification code needed? What are the uses of Virtual Debit Card? To begin with, what exactly is a virtual card? As the name goes, a virtual debit card is similar to an invisible card. However, herein there is no actual involvement of plastic card. But if there is no tangible card then how what makes a card itself? Well, on applying for a virtual visa card India; the user will not be getting a debit card on mail or SMS. Rather herein, the user will get only a 16-digit that will be sent via email. As mentioned, unlike a physical debit card, herein one won’t receive any tangible card. Instead on making application via mail, the user will be sent a 16-digit debit card number along with all the details of the card mentioned in the email. Along with the 16-digit number, the user will also be sent another 3-digit verification code which will be used by the vendor for verifying the details of the owner. However, there is no need for the customer to open a separate bank account for carrying on the transactions. The verification code is an essential aspect of virtual debit card, wherein no password or CVV number is required for carrying on the transaction as in the case of physical debit card. The verification code which is sent via email is used by the vendors to carry on the transaction and authenticate the owner’s identity. The USP of this virtual visa card is one can use the card through the existing bank account or by linking it to another credit card. More often people end up forgetting their wallet or card at some place or loose it due to theft. It often leads to major loss if left unnoticed. Herein, the customer is required to block their credit card or debit card, preventing the misuse of the same by the thief. However, with Virtual debit card, the worry of theft is cleared away. As there is no involvement of tangible plastic card which can be stolen or misused, it prevents one from falling prey to financial loss. All one needs to do is generate a verification code that would help verify the authenticity of the user when carrying out a transaction. It has to be noted that the virtual visa debit card India can be solely used for carrying out online transactions. The card works in similar lines as that of debit and credit card but for the generation of virtual 16-digit debit card number. One can place the order just by entering the 16-digit debit card number followed by the three digit verification code (here acts as CVV of the debit and credit card) and your purchase is completed. 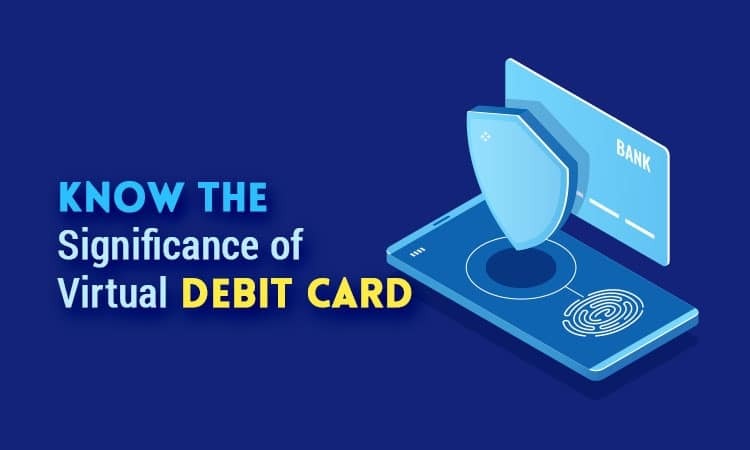 While for availing a plastic card, one is required to fill in their income details; in the case of virtual cards no such verification is needed. In addition, unlike plastic money, there is no credit checks carried out as well. Unlike credit cards and debit cards wherein exists a set limit for spending crossing which one is liable to paying interests one needn’t worry of overspending in case of virtual debit card India. As the money is directly deducted from one’s bank account, the person can spend until he/ she has money in their account. The user is not liable or levied with charges of late payment fee or over limit fee. In addition, since it is not a check, one need not worry about non-sufficient funds fees too. If you are shopaholic then, this card is perfect for you. You can carry on innumerable purchases (till you have enough balance in your account) anytime, anywhere. However, in case you do not shop much online, you can anytime opt for a prepaid virtual debit cards that are linked to your account. Using virtual visa card, one can also add on funds to the cards through existing bank accounts, money order or another credit card. However, opting for this medium will be liable for certain fee load charged on each deposit. There is no set audience for using virtual debit card. These cards are particularly designed for a wide arena of audience which caters to people with no credit cards, college students, individuals who are self employed or have their own income source as well as those with bad credits. The working of virtual card India is no complex and is extremely simple. Here in case of virtual cards, the money is directly deducted from the bank account. It is particularly useful in carrying out online transactions such as purchasing products through online medium. Many a times, due to insufficient funds in credit card or unavailability of cash makes it difficult for one to make purchases. With virtual debit card one is only needed to feed in the debit card number and verification code and the purchase is completed. It is especially catered to meet the needs of customers such as college students, self employed individuals, people with no credit cards, etc to carry on the online purchases with ease. Also there are lots of free websites available online from there you can create free virtual cards that you can use in Website Testing and debugging. Which helps great to website and software developers who made online payment website and they can easily create virtual card and test those applications. Online Virtual Debit card its help to feel you secure to avoid bad transactions.